After posting about the new HST method I'm using, I was asked about the math. My husband, who is far more savvy at Excel than I, whipped up an equation for me to plug the numbers into. 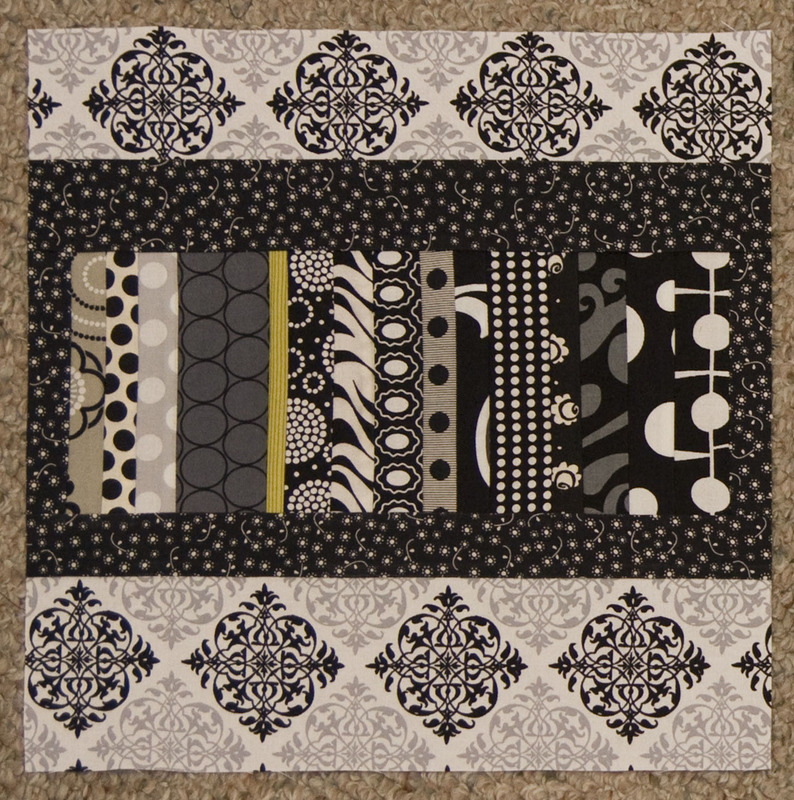 The first number listed is the size of your original sewn squares prior to cutting the HSTs. The second number is your unfinished HST size. 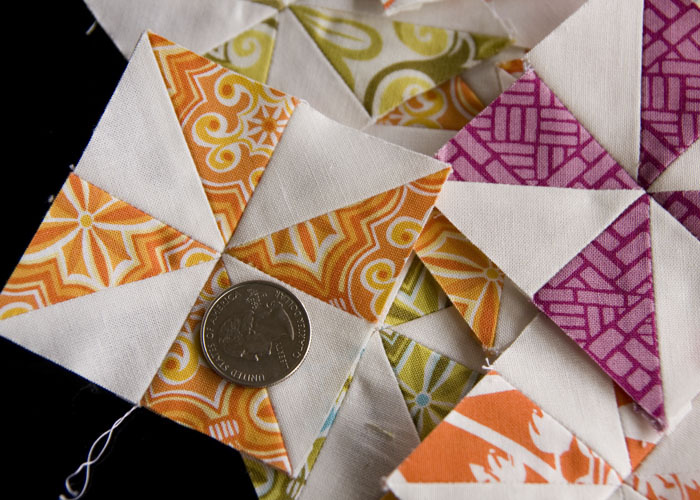 If you are starting with 5" charm squares, you will make four 3.18" HST from a pair of charms. It's likely you would trim this down to 3". I left the actual measurements intact to help people decide which size they really need considering trimming to size. All sizes shown are in inches. 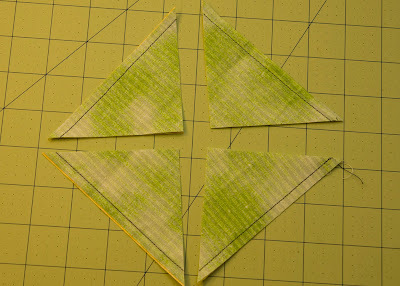 I've converted to doing half-square triangles (HSTs) a new way. I saw this technique for the first time on Christie's blog Describe Happy. 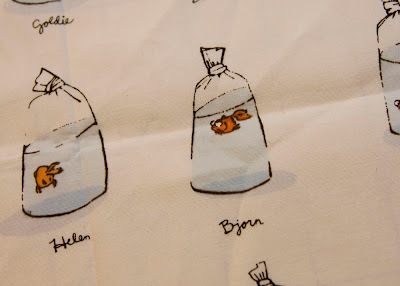 I tried it on my Central Park pillow, and I will never do them the old way again. I haven't seen this technique before and wanted to share a few pictures. 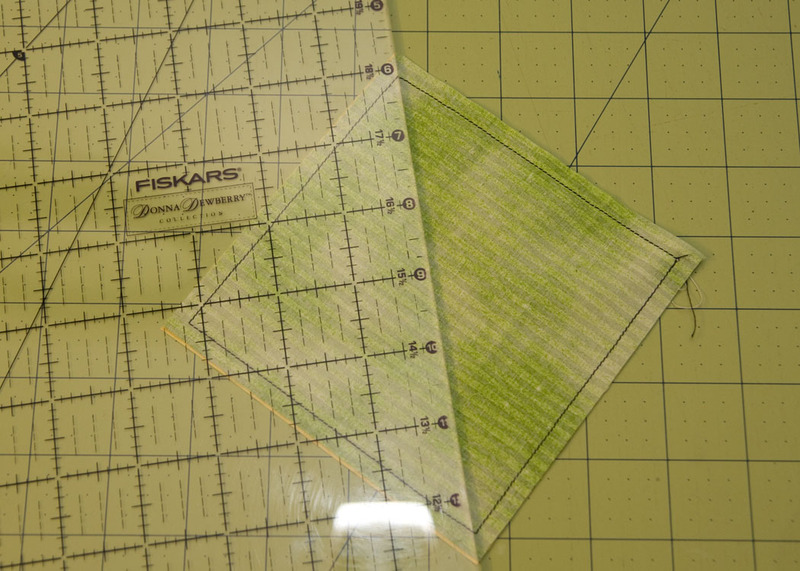 I found this actually produces more accurate HSTs than the typical method of marking down the diagonal and sewing on each side. 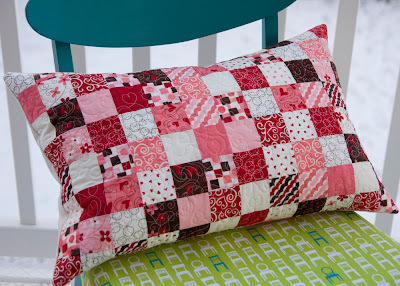 I still had to square mine for the pillow because they were so small, but I think I could get away with not squaring them on larger blocks. The whole process goes much faster. 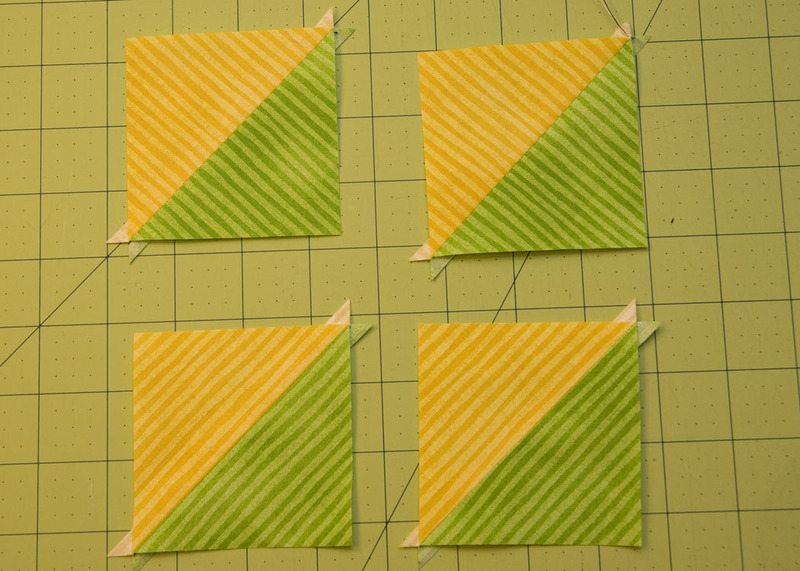 There is no marking, and you get twice as many HSTs for each pair of squares. Start with two squares the same size. 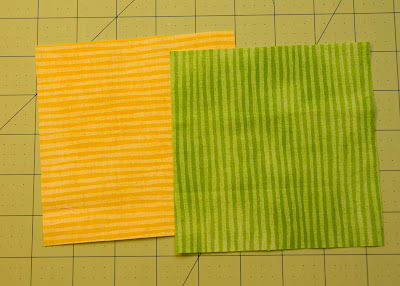 Match right sides together and sew a 1/4" seam all the way around. Pivot with needle down at the corners. Now slice them up, cutting on the diagonals. 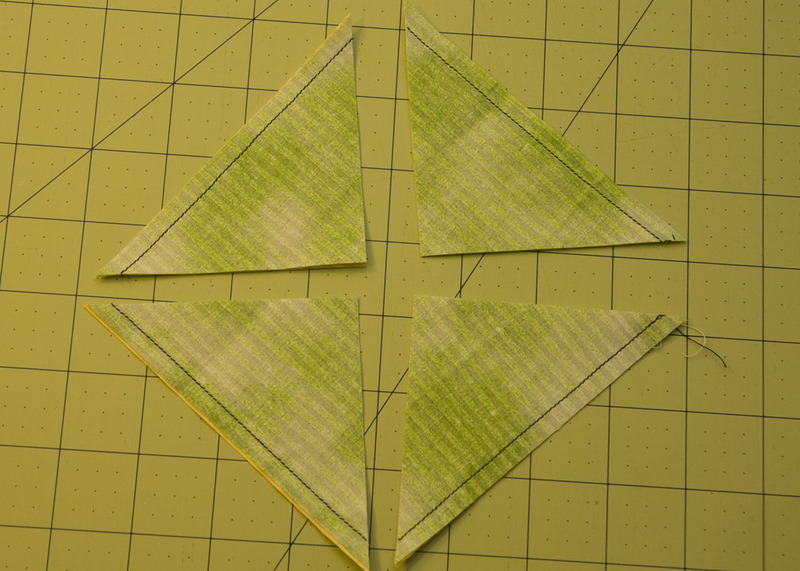 This results in four almost-perfect HSTs. 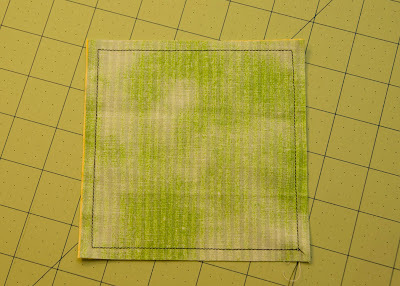 For my pillow I used 3" squares which resulted in four 1.75 unfinished HST. A 5" charm square will make four 3" unfinished HST. Edit: The method does create all bias edges. 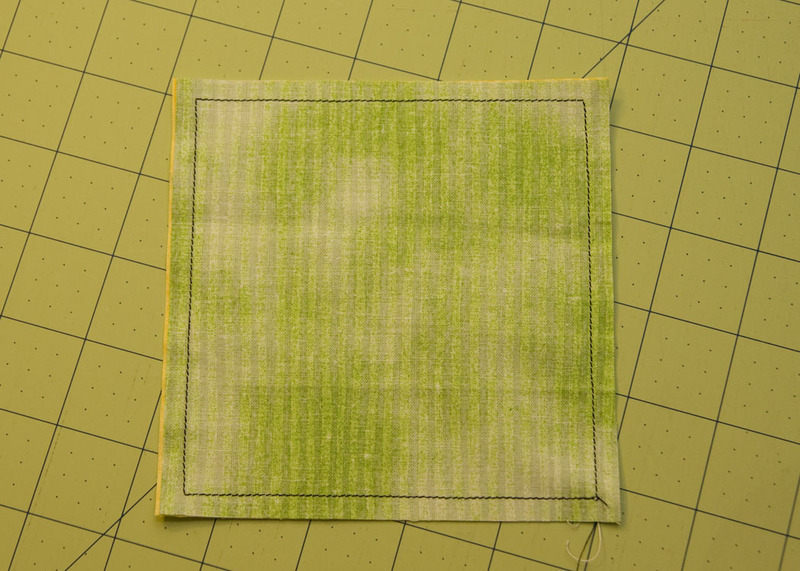 I didn't find that problematic, and actually found it helpful with the small squares. The extra give helped me line up my edges. 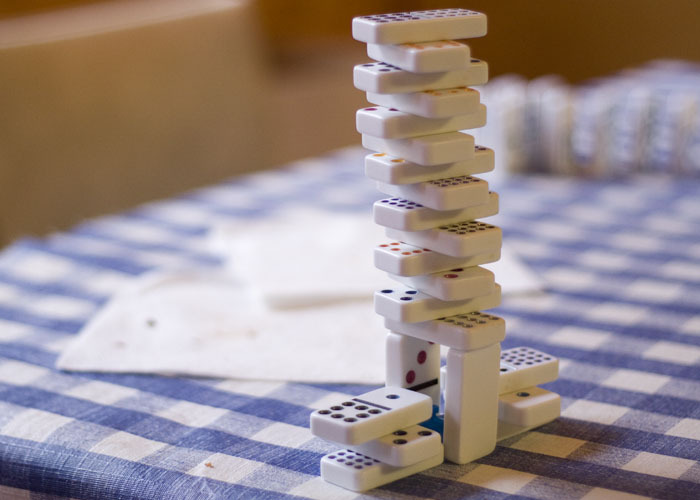 If you are concerned with the bias, it would be best to use the traditional method. Try it out. You'll never make them the old way again. 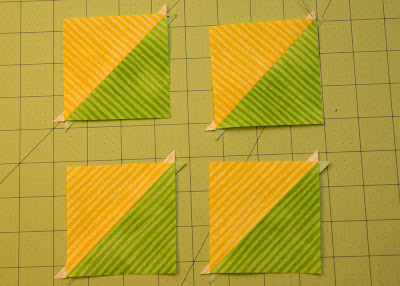 Thanks Christie for showing me a better way to make HSTs! 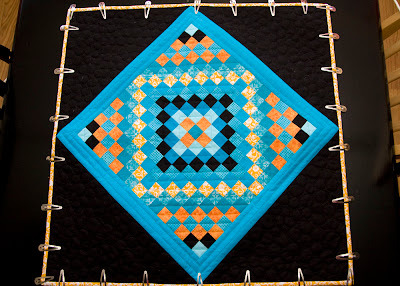 Squares sizes and unfinished HST sizes are listed in this post. Edit: While I was very excited about this method the first time I tried it and with a couple other projects, I've returned to the old way of doing HST. I've just realized I'm not a fan of those bias edges. 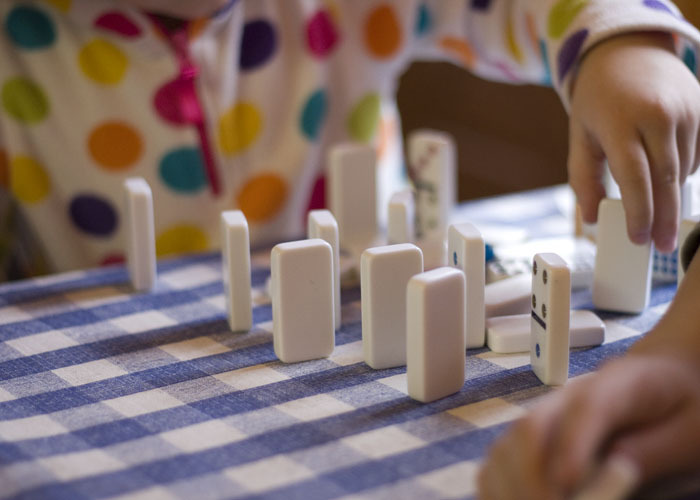 There are multiple ways to create HSTs. Choose the one that works best for you. 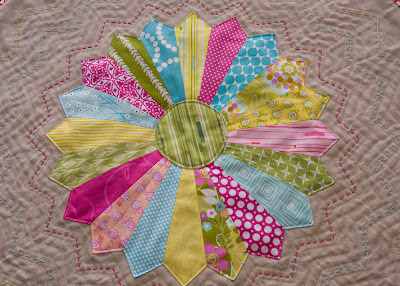 Remember those tiny pinwheels? They became this new pillow for my couch. There are 256 half-square triangles in this pillow. 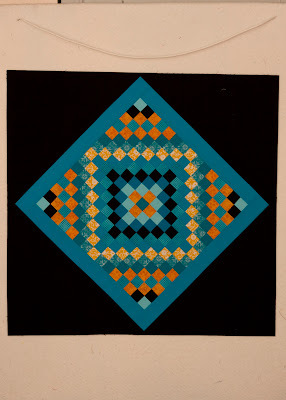 Each square is 1.25" finished. 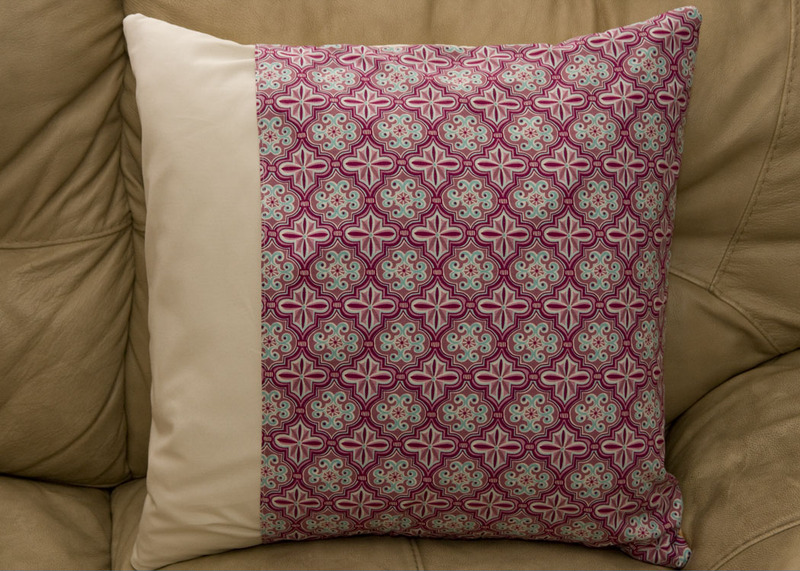 The pillow is 20" x 20". I'm honestly not sure I'd make this guy if I had it to do over again. It was a lot of work, and I have a serious dislike of HSTs at this moment. I was cursing all those fat seams where all the points meet up. I almost scrapped it a couple times, but I kept going because I've wanted to make a pillow from tiny HSTs for a while-- actually, since I first saw this pillow. 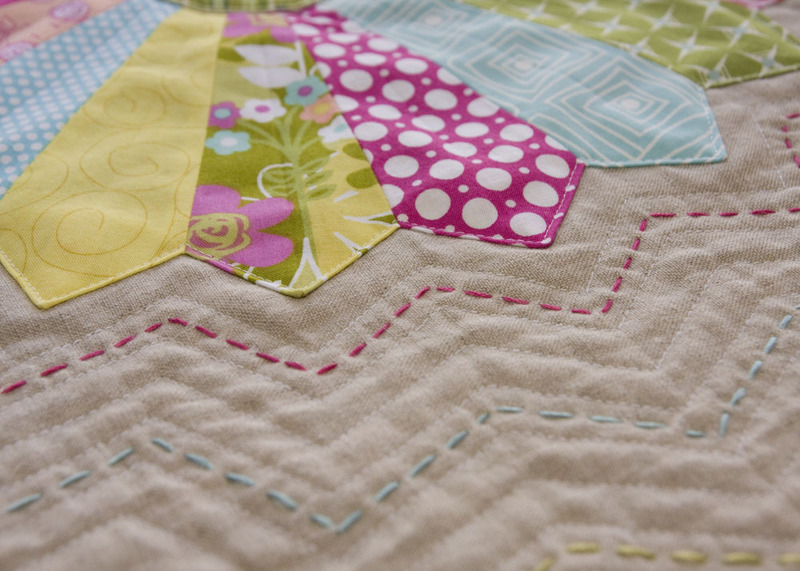 I quilted it quite heavily with my typical loopy design to make sure no seams popped open. I made a basic envelope back with one of my favorite prints from Central Park. 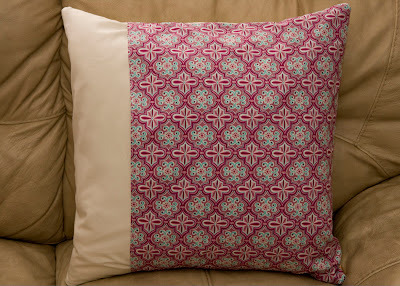 I have plans for a couple more, much simpler, pillows from my remaining charm squares. Despite all the work, I'm really, really happy it is now sitting on my couch. 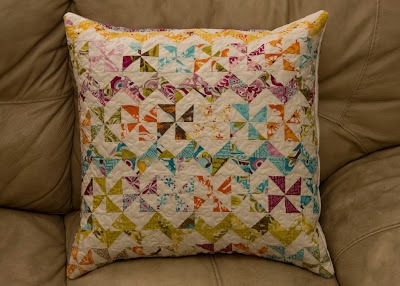 I'm linking up to the February Blogger's Pillow Party on Stitched in Color. I had the chance to spend a few days with my family at my mom's cabin for Presidents' Day weekend. Today we're recovering. It's a five hour drive, and we only seem to make it up there once or twice a year. Miss C and I made the trip with my sister and her husband. We left the hubs home with the twins for this trip. My other sister and her family flew in from TX and drove up with my mom. It snowed most of the weekend, but it was nice to be detached from the internet for a few days. I had 262 posts in my reader when I finally sat down to sort through it during naptime today. I haven't made it very far. I've spent most of my day cleaning and doing laundry around here. It's amazing how much catch-up there is when you leave for just a few days. There is about 4-5 feet of snow up there. The kids loved it. 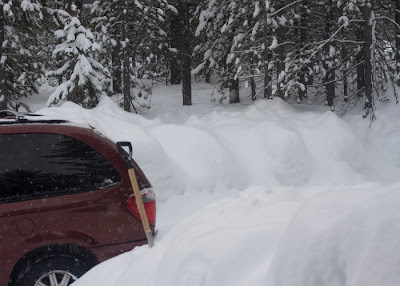 I, on the other hand, wasn't so fond of it after getting stuck in the van, but at least that was on the way out and my BIL was able to push us out. Sunday afternoon the Miss C and her cousins spent 3+ hours playing with dominoes. I may or may not have taken both of my sewing machines with us. I also may or may not have stayed up way too late sewing with my sister. I did get started on my newest project. Although, they started to drive me nuts. I had to stop after a while. 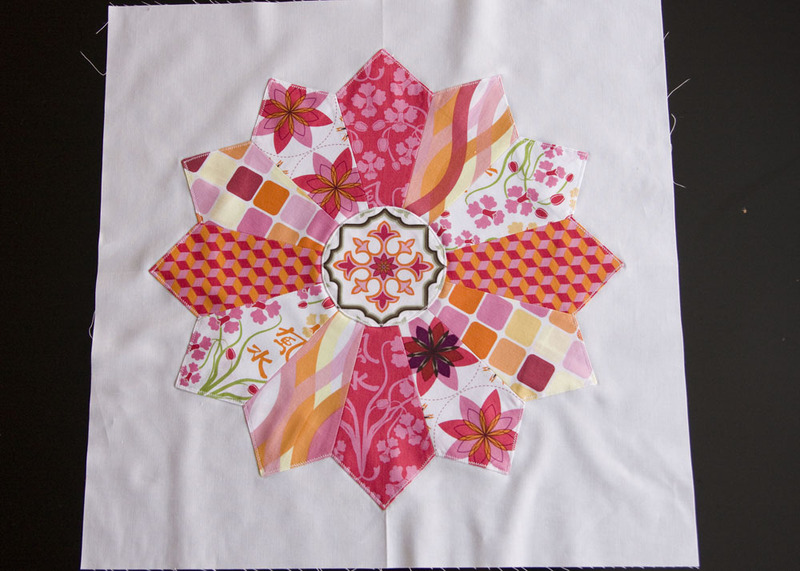 These pinwheels will be 2.5" finished. It was a good weekend. Now back to that laundry. I might get caught up by Friday. 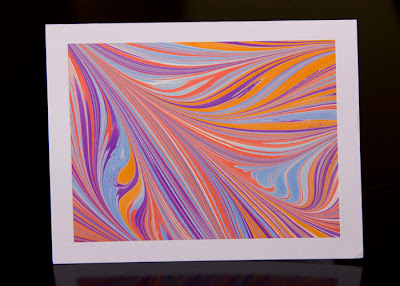 I entered a giveaway about two weeks ago for three handmade cards by Katie from Marbled Cards. I was so excited when I won. I received my pick of three of her fabulous cards the other day in the mail. They are honestly so very cool. 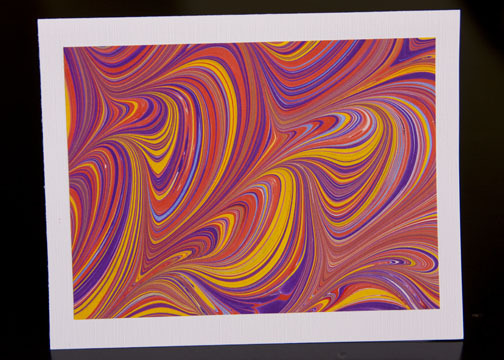 She makes these cards by floating paint on the surface of water. The detail is amazing. Go check out her Etsy shop. 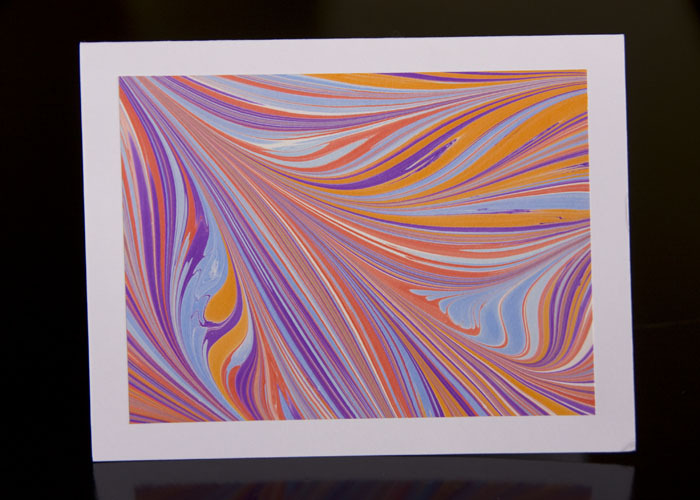 Every card is completely unique, and she has dozens of different color combinations. Modern Day Quilts is featuring the back of my World of Goo Quilt. I came across this site when she featured Val's amazing owl quilt from Pink Please. 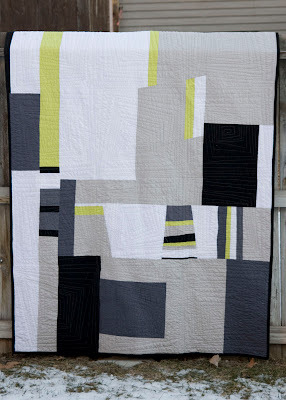 Modern Day Quilts just posts one great modern quilt each day. 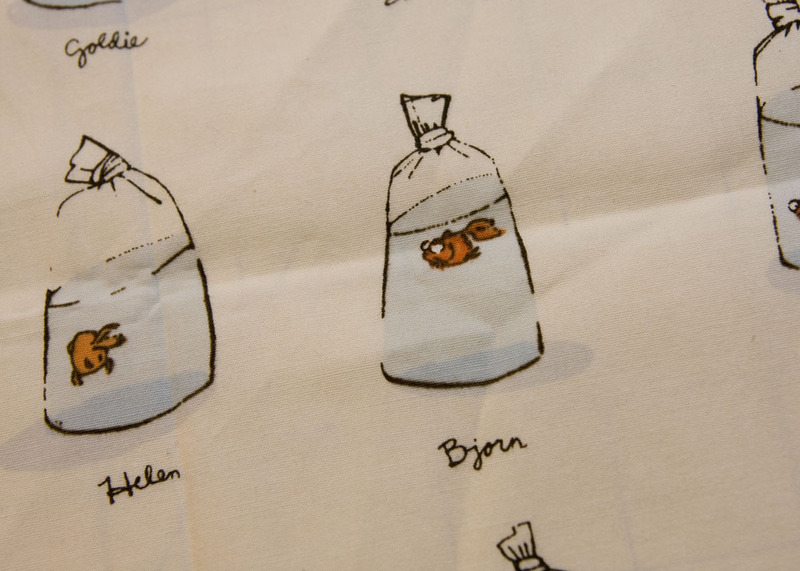 It's a fun way to find new, fresh ideas. I was a bit late to get on board much with the Heather Ross craze. I'm not exactly willing to spend $25 for a fat quarter. 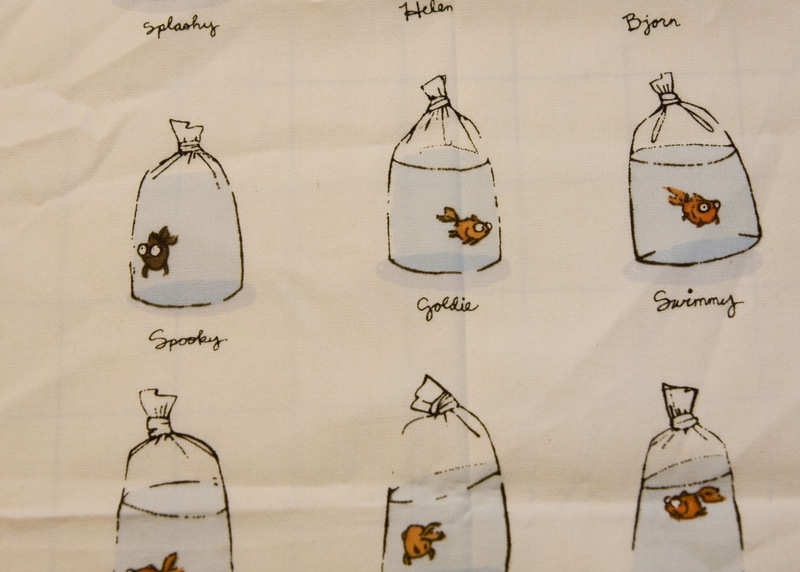 I think a lot of her prints are super cute, but my absolute favorite was the goldfish in bags. I just love them. My fabulous friend, Leigh from my quilt group, offered to trade a piece of said goldfish for some of my scraps. She stopped by the other day and handed me this great piece--about a fat 1/8. I was really excited. 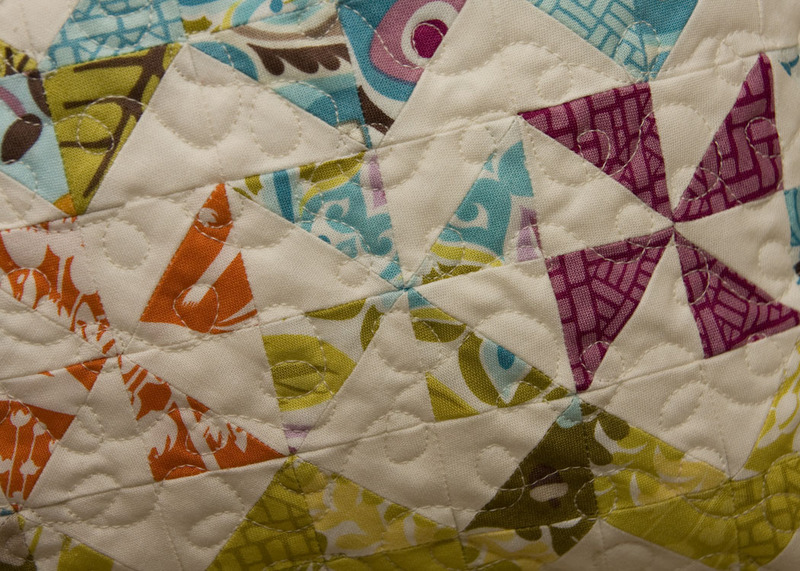 She perused my scraps, and we chatted about quilting. She took a handful of scraps. I definitely feel like I got the good end of the deal. 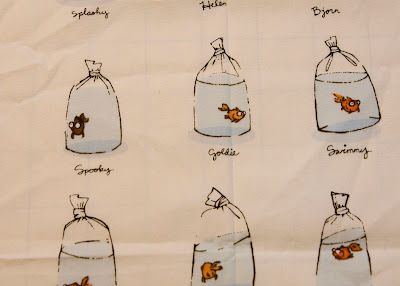 Now I just have to make decisions about what to do with Swimmy, Spooky, Goldie, and Splashy. Aren't they cute?! I've had several questions regarding a couple of my projects I showed on my last post. A few of the comments were from "no-reply" bloggers, so I figured it would be easiest to provide this info in a post. I first tracked down this post from Homemade by Jill which pointed me to this tutorial I used from About.com. I found the finished cover was a bit too long. I didn't want it to actually touch the counter. I trimmed just a bit off the edges, but other than that it worked great. 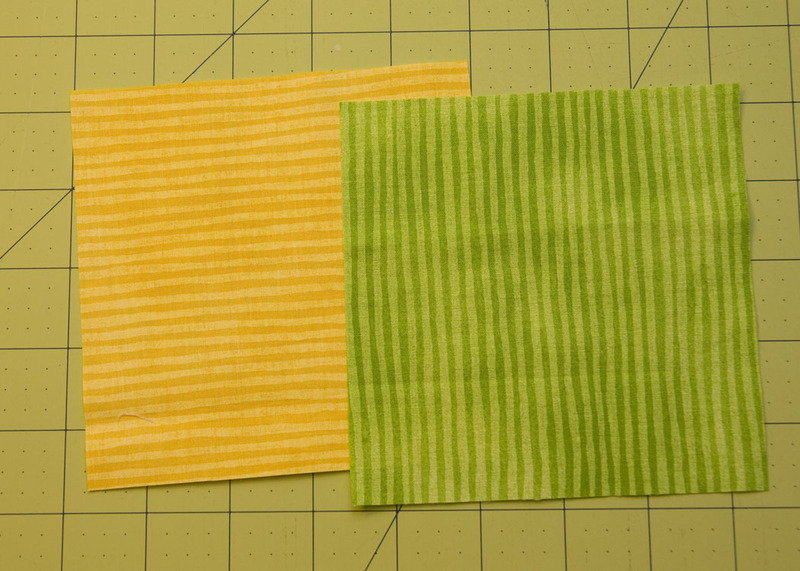 I made my own piping using the same bias tape I used on the bottom binding. I love piping. It makes so much difference. 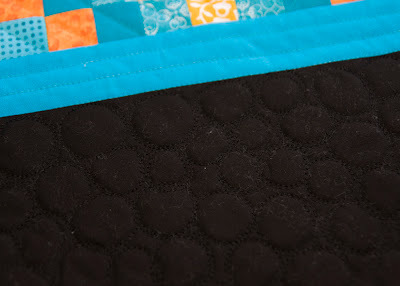 I also made a simple white lining because I like to cover up ugly inside seams. 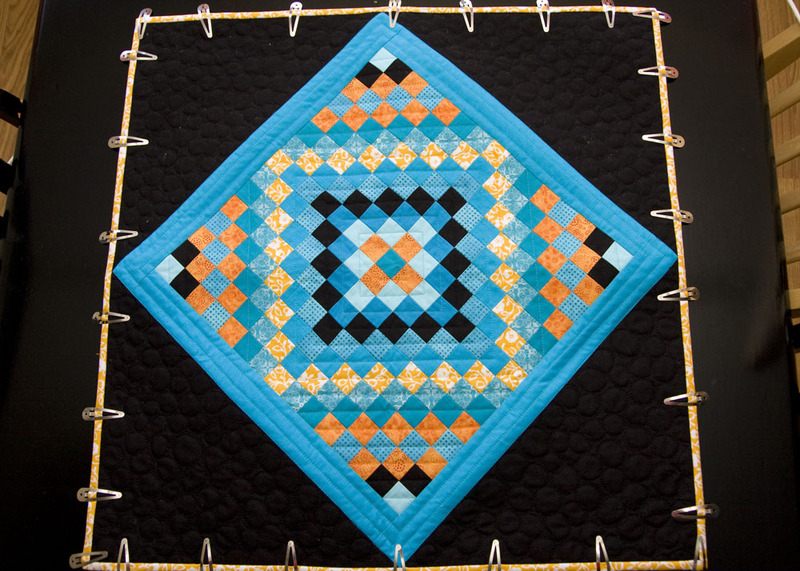 I had been thinking about doing the hand quilting. 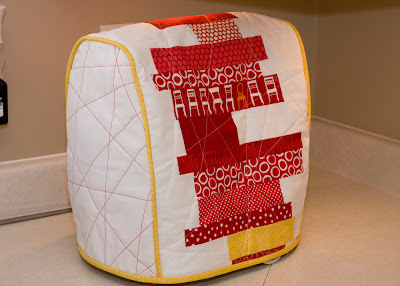 Then conveniently, Kate Conklin posted a great little tutorial on hand stitching just a couple days before I made my project. I found it helpful. I couldn't find any pearl cotton that matched and didn't want to order anything. I used DMC floss in coordinating colors--all 6 strands. The batting I used on this project, as well as almost everything I make, was Warm and White. I have no clue what kind of needle I used, but it looks about the same as the one Kate shows. I just found it with my old cross stitching thread and figured it would work. 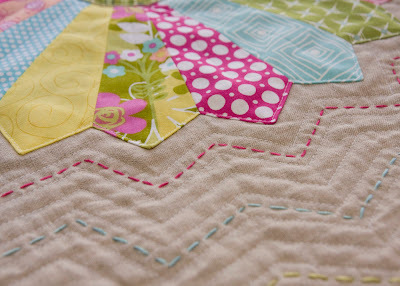 I found the hand quilting to be far easier than I initially imagined and love what it added to the project. I will definitely do it again on other things. A couple of my fingers did get quite sore. I only used my metal thimble. I may get a couple rubber ones to protect the other fingers for next time. Friday was a sewing day for me, thanks to my wonderful husband. He asked me what I wanted for Valentines Day/ our anniversary (they are just a few days apart). He offered suggestions such as a massage, pedicure, facial, etc. What I really wanted was a day to sew and have a day off from being the mom. When I suggested this, he told me he would give me two days! 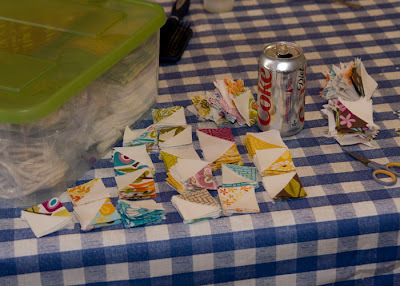 I took my first sewing day on Friday (the hubs has every Friday off). He let me sleep in until 9:30. I headed down to sew and accomplished quite a bit. I did help out with lunch and dinner and a few other things, but for the most part he watched the kiddos on his own all day. It was really nice to be able to focus for a long amount of time on projects I've wanted to get done. I worked on my swap projects to get them off my shelf. 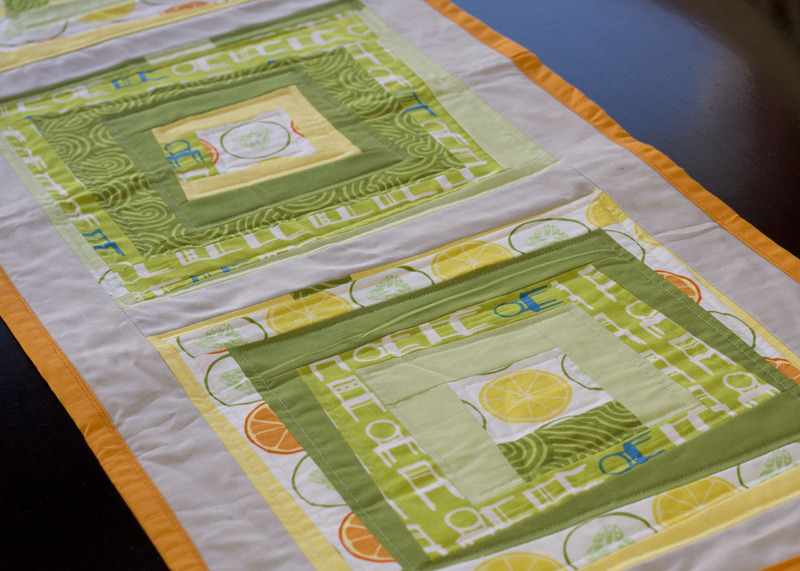 First I quilted my quilt for the Doll Quilt Swap. I just need to finish up the binding. Here's my little photography helper. 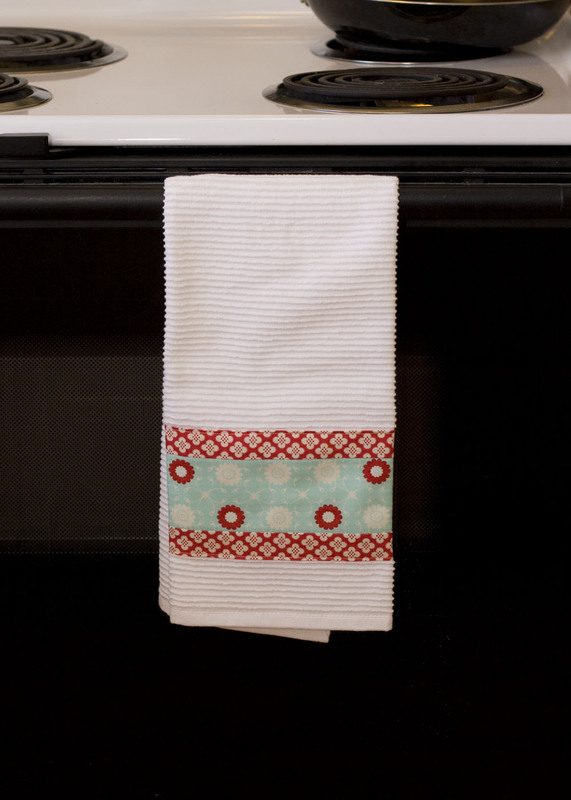 I also worked on my project from the Urban Home Goods Swap. 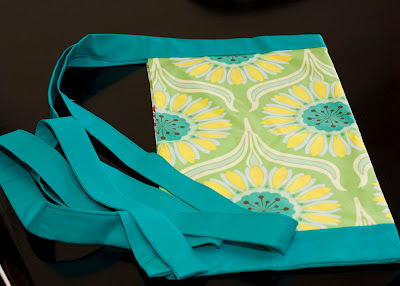 I did the hand stitching and binding on Saturday and Sunday during naptime. My swap partner has a small dining table. 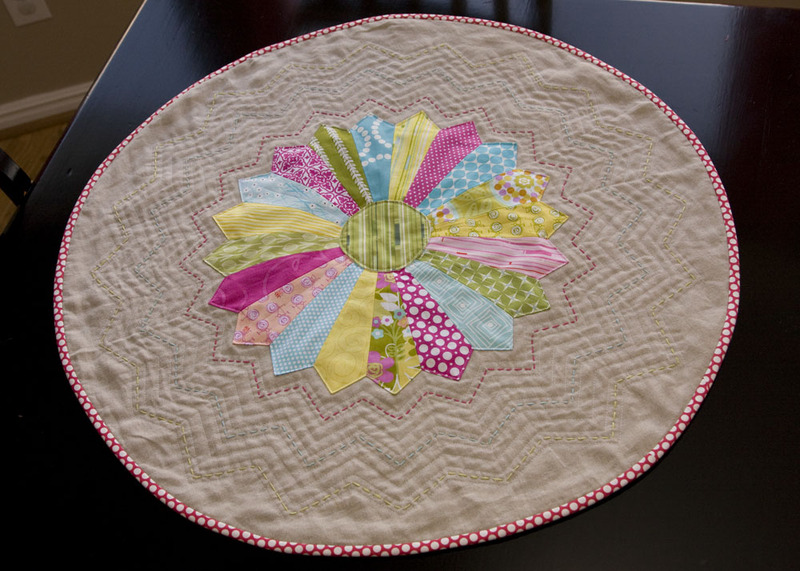 I thought this would be a fun, unique table topper rather than the typical rectangle table runner. 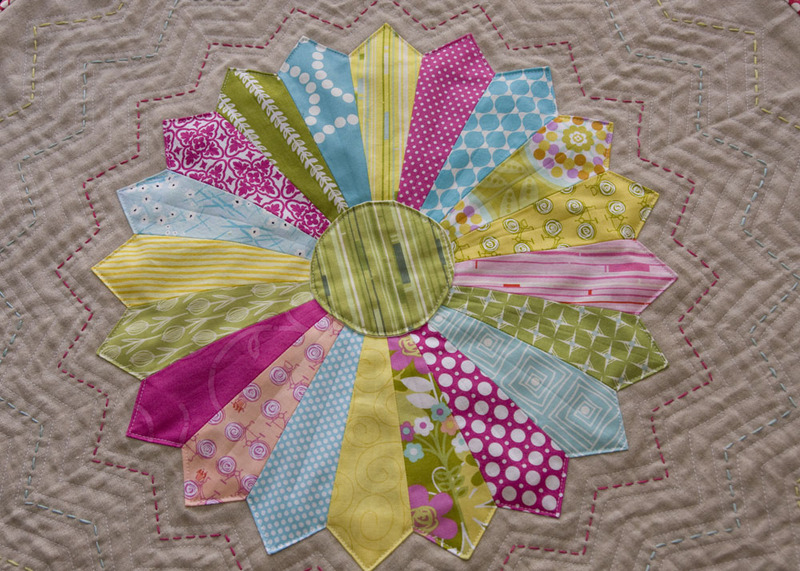 I've wanted to try making a circle quilt for a while so this was a great opportunity. 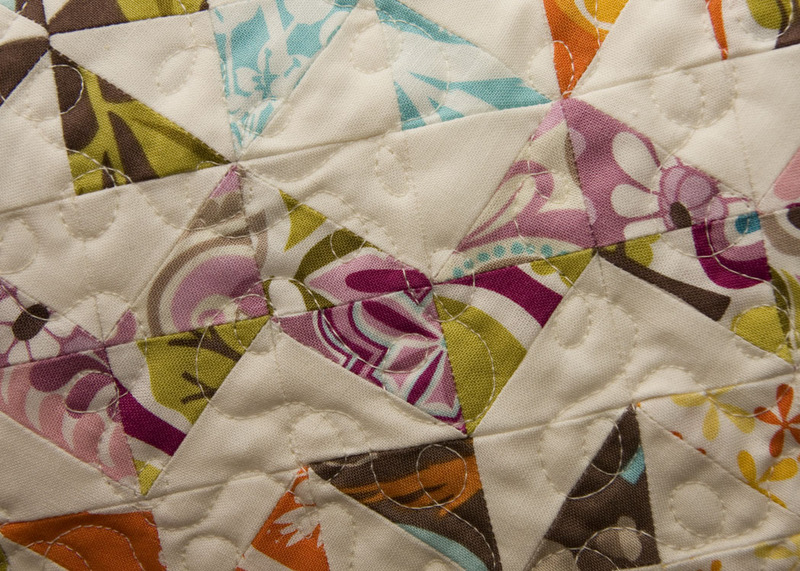 I debated between backing this scrappy Dresden with natural linen or white. I'm so glad I went with the linen. I think the white would have been too bright on this project. 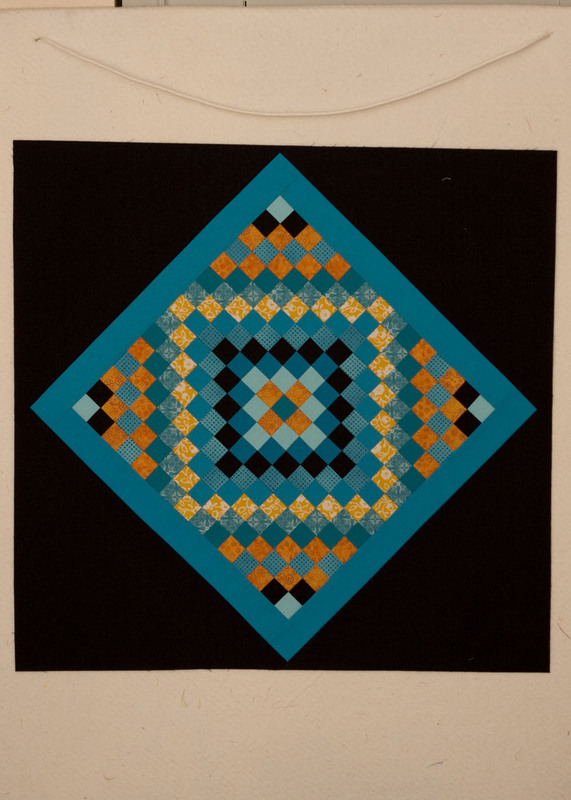 This was also my first try at decorative hand quilting. I really like the effect. Finally, I finished my project for the Spicing up the Kitchen Swap. 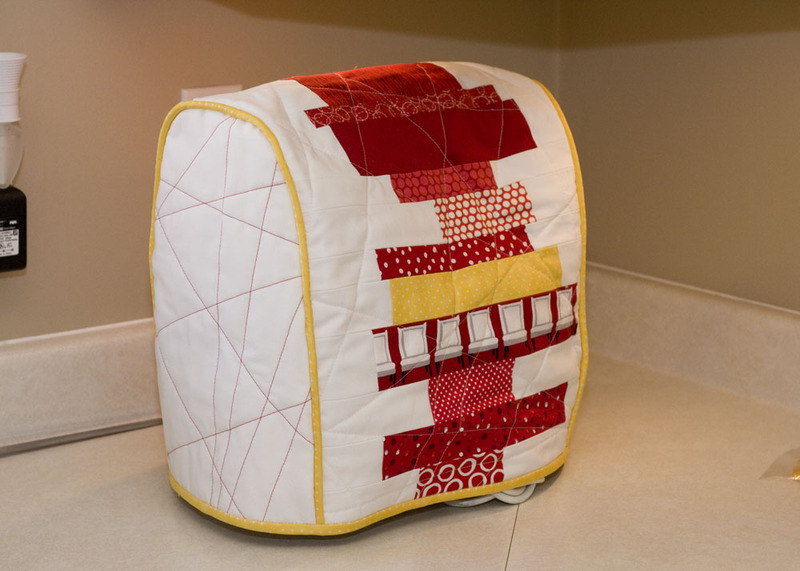 First up is a Kitchenaid mixer cover. I was really excited to show my husband this project. He then asked if I was going to make one for our kitchen as well. I just might. I'm also sending a towel embellished with Bliss. I'm almost done with my swaps. It was fun, and I was able to make some projects I normally wouldn't have. Although, I don't think I'll sign up again for a while. 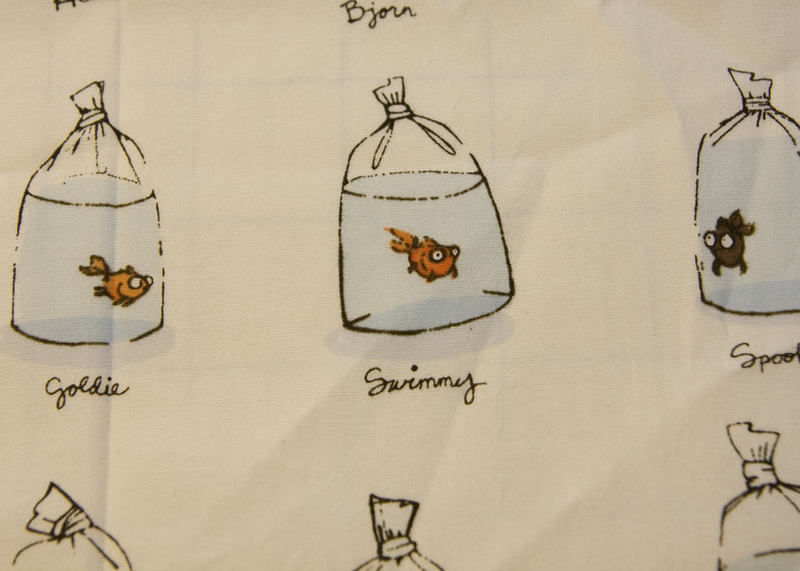 There are too many other projects of my own that I'd like to devote my time to. 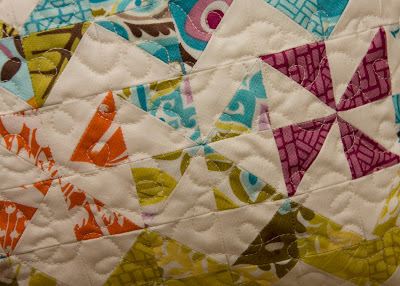 I think I'll use my second sewing day to work on my quilt for the Modern Quilt Guild Challenge. I'm not sure the hubs is ready for another day in charge for a while, though. 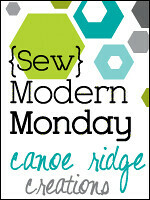 I'm linking up to Sew Modern Monday over at Canoe Ridge Creations. Head on over there and see the other great projects. I was invited to join in on the first round of the Spicing up the Kitchen swap on Flickr. It's been fun to watch all the great items people have been making. There are some fun packages going out in the next couple weeks. 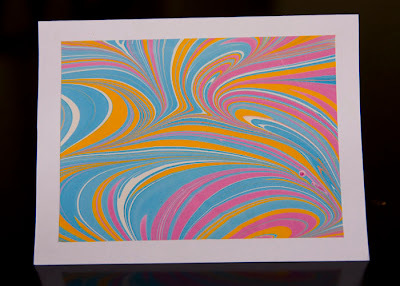 I received my package on Friday from the fabulous Elizabeth from Don't Call Me Betsy. She was my secret swap partner. I was so excited to see her name on the package. She runs our amazing quilting bee and does some great projects. It's extra fun to receive a great package from someone you know. 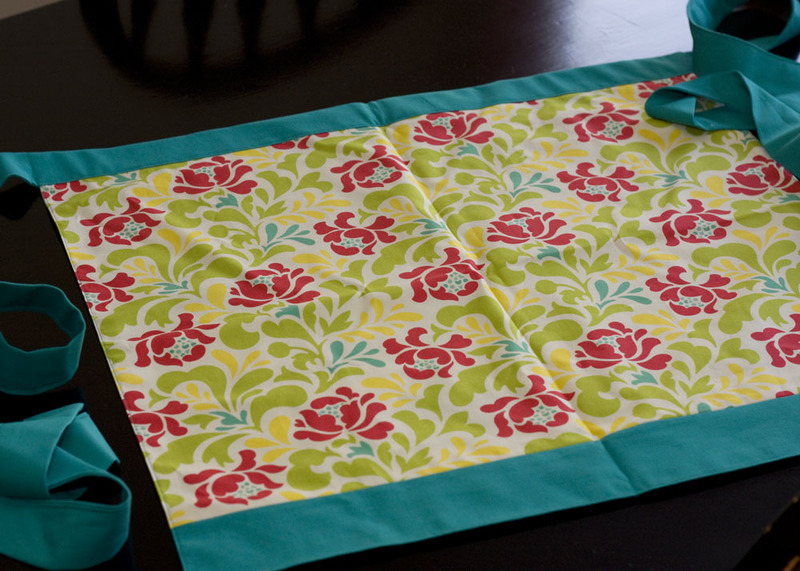 Elizabeth sent me a wonderful table runner that matches my kitchen towels I made a while ago. She also sent me a reversible apron which I'm so excited to use. 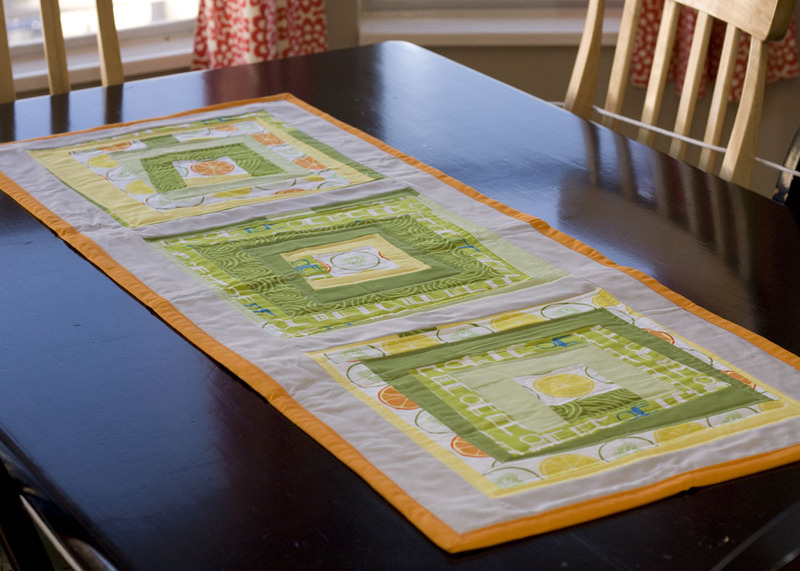 When I saw her pictures on Flickr for the table runner, I secretly hoped they were for me. I love how cute it turned out. Now if I can just get the twins to leave the it alone. Thanks so much Elizabeth!! I love both items. I'll be sending my package out to my secret partner in just a couple days. Preview pics tomorrow. The voting is on for AnneMarie's Love Next Contest. 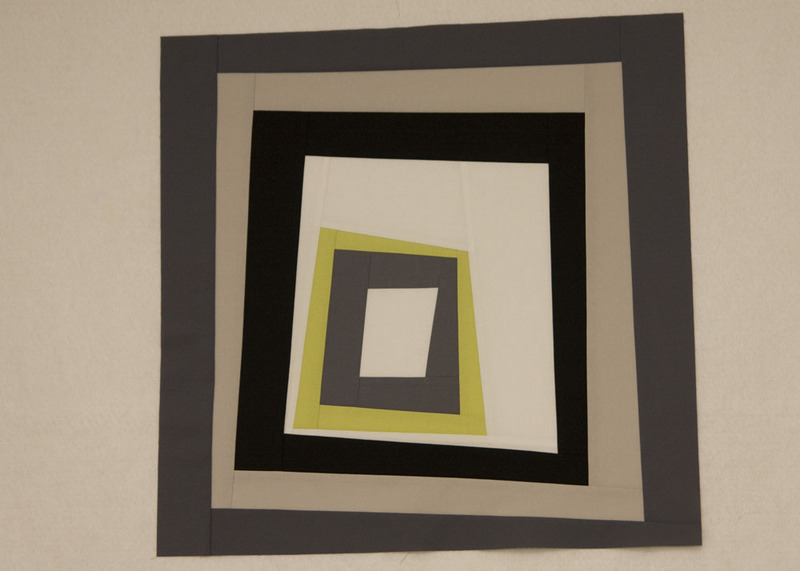 Head on over to Gen X Quilters and vote! The poll is on her right sidebar. 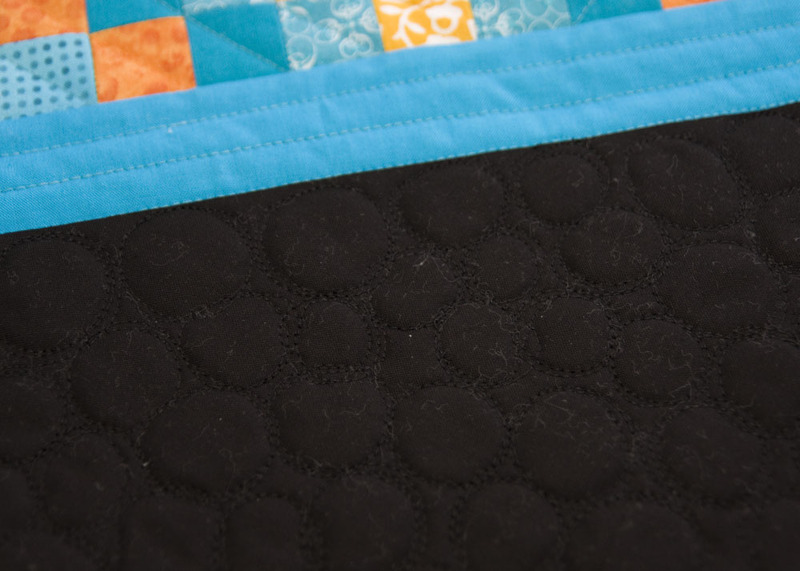 I entered my World of Goo Quilt. It's number #33 on the list (just in case you might want to vote for it!) There are some really fabulous quilts this time around. Thanks to AnneMarie for putting together such a fun contest! 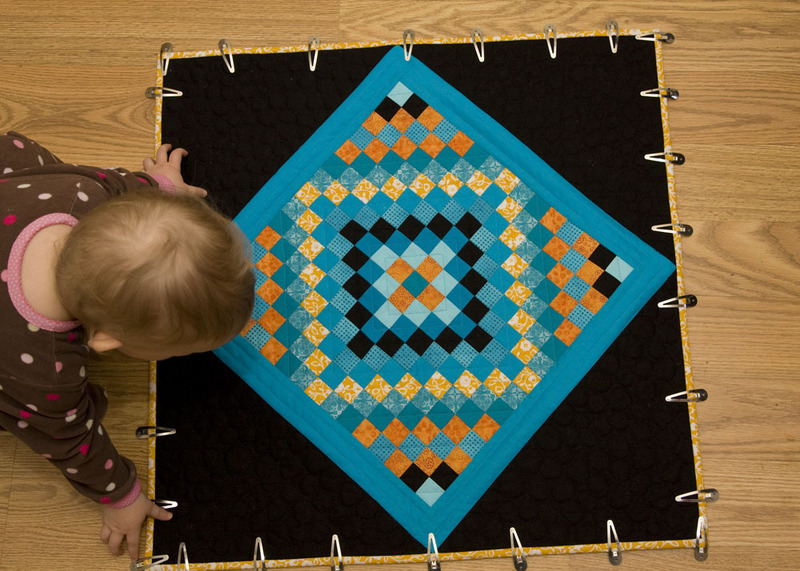 On a side note about the World of Goo Quilt--I received a super fun e-mail the other day. The designer of the video game World of Goo sent me an e-mail. He just wanted to let me know that he liked my quilt. He even sent the link along to his mom who is also a quilter. It's always fun to be noticed by those who provide such great inspiration. It made my day! Shruti over at 13 Woodhouse Road is doing a great series this month sewing spaces including fabric storage, scraps, and WIP's. 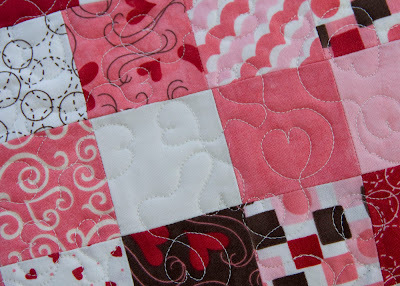 I wrote a post on my scrap system that she is featuring today. Go on over and check it out. 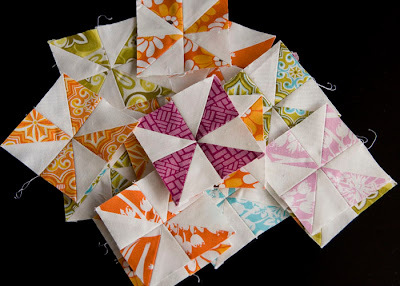 Leave a comment over there to be entered to win some charm packs from the Fat Quarter Shop! Have a great day! 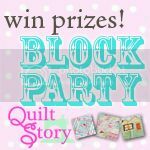 I decided to join in on the Quiltstory block party and have blocks to enter into each category. This makes me wish I had taken more pictures of my individual blocks. 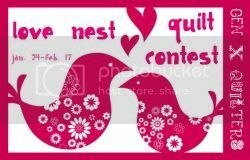 I have some others that would have been great to enter, but sadly, they are now quilts and don't quality. 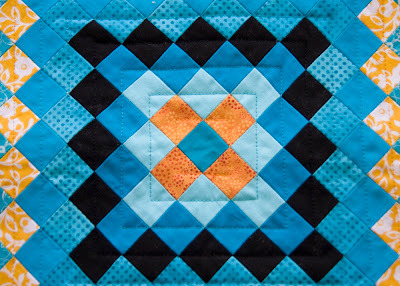 Head on over to Quiltstory and check out the other great blocks people have posted. I got a few hours of sewing in on Monday. Miss C was sick and actually took a two hour nap on the couch. I sewed while all the kiddos slept. I was able to finish up the top for my project for the Doll Quilt Swap. My swap partner's tastes are quite a bit different from mine. I hope she likes this. It's not normally something I'd make for myself, but I think she'll like it. I'm really happy with how the design came out. 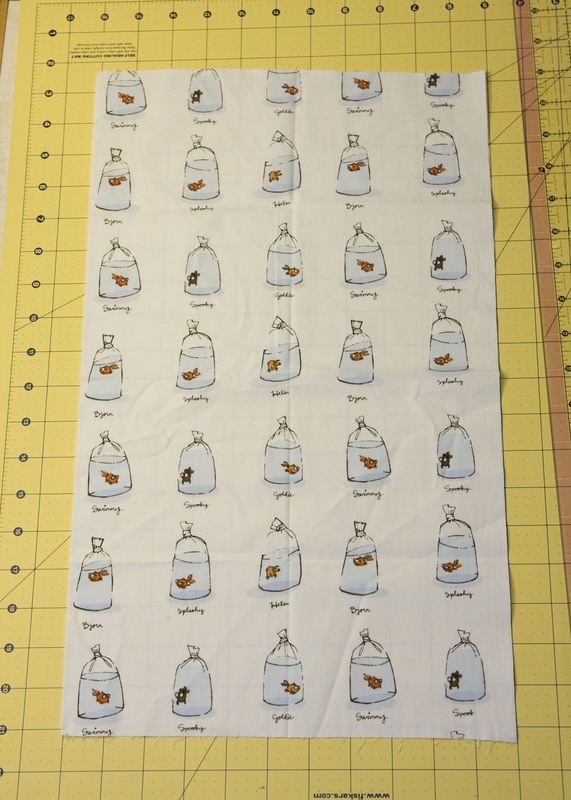 It was a lot of tiny squares--225 to be exact. They are 1" finished. I pieced them individually. 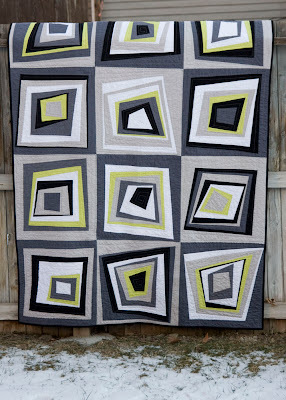 Now I have to design the back and decide how to quilt this guy. The sewing scene is seriously slowing down around here. The kids are getting busier, sleeping less, and we moved my sewing stuff to the basement to make space for a playroom. I sewed a few rows on my quilt for the Doll Quilt Swap, but that's about it. It does make me a little sad. 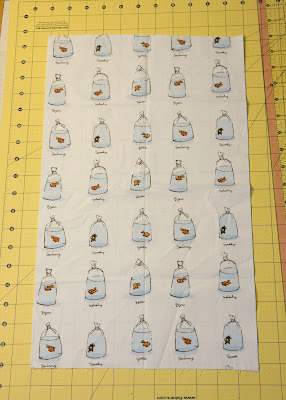 I will be spending pretty much all my February sewing time working on projects for my swaps. I'm thinking this will be the last time I sign up for swaps for a long time. Although it's fun to make something for someone else, it's hard when you have deadlines and have to spend all free sewing time on those projects. Maybe I'll do it again in a few years. Although there wasn't much sewing, I did make this fabulous sandwich I wanted to share. It's a bit high maintenance. (I think anything with real bacon is high maintenance. I seriously dislike cooking bacon). Despite this, it was totally worth it. I added a slice of provolone which I thought was a good improvement. I also thought the mayo was much better after sitting in the fridge for a few hours. I liked the balsamic vinegar on the heavy side. It really made the difference on this sandwich. This recipe is definitely in my stack of keepers. Yum! 1. Heat broiler. Combine mayonnaise and chives in small bowl. 2. Cut each bread piece horizontally in half; place cut-side up on baking sheet. Broil 2 to 3 minutes or until light golden brown. 3. Immediately brush bread with vinegar. Spread with chive mayonnaise, using majority of mayonnaise on bottom halves. Place tomatoes on bottom half; sprinkle with salt. 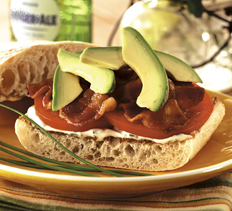 Top with bacon, avocado and top half of bread. I finished up my second Valentine's pillow. 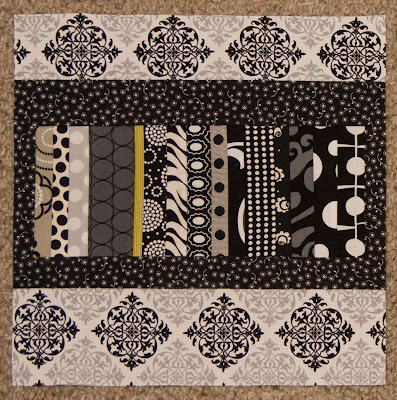 I think the L'Amour fabric will go back in the pile for another year. 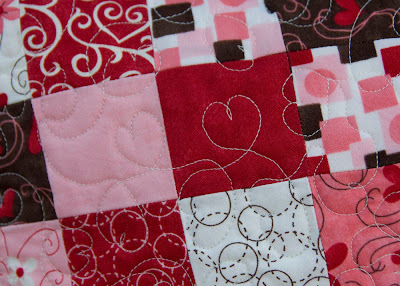 Maybe I'll get the urge to sew a Valentine's quilt next year. 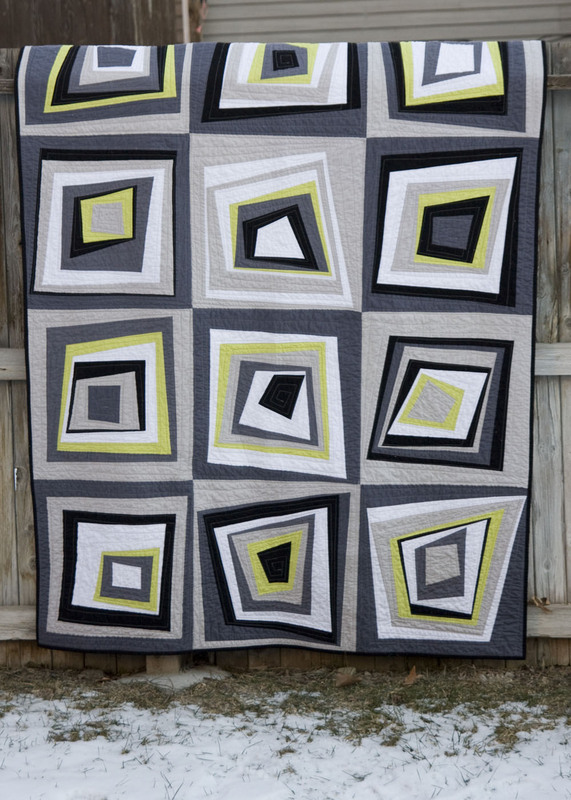 I had fun trying a new pattern for free motion quilting. I did my basic loopy pattern, but this time made the loops into hearts. 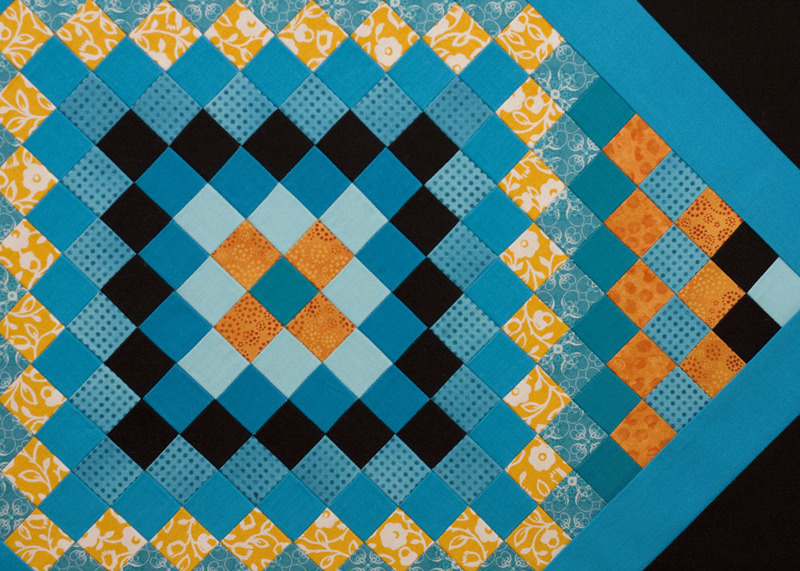 I don't often try new FMQ patterns so it was nice to change it up.